Wendell Rijo slides back into first base on a pickoff attempt Sunday against the Reading Fightin Phils. Rjio advanced to second on the pla, as first baseman Rhys Hoskins couldn't handle the throw. 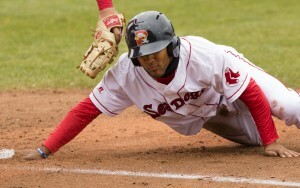 Wendell Rijo slides back into first base on a pickoff attempt Sunday against the Reading Fightin Phils. Rjio advanced to second on the pla, as first baseman Rhys Hoskins couldn’t handle the throw.